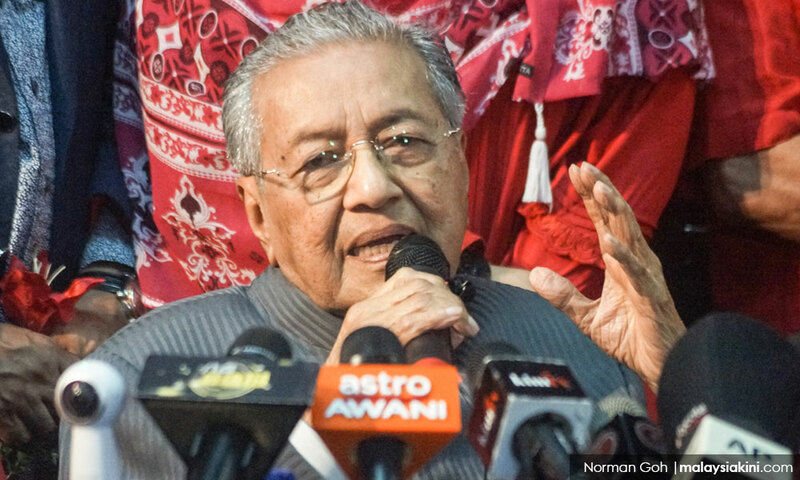 COMMENT | Is anyone stupid enough to think that Dr Mahathir Mohamad wants to get in touch with his inner “keling”? The same opposition supporters who go on about our “apartheid” state have no problem when the designated head of the opposition uses a term which Indians consider derogatory. Indeed, we get the same horse manure of the origins of the word as if its current usage is anything but derogatory. Not only do Indians consider it derogatory but everyone else except, of course, on social media where we get long explanations of the term. Try saying that to an Indian in real life and see what the response is. Indeed, the last time Mahathir used the word – which he should know is a slur – a PKR leader said this - "Although I regret the usage of the word and urge Mahathir to rethink the need of using such words in future, at the same time, Malaysians must be cautious of attempts to divert attention" – yes, no kidding. I am sure Pakatan Harapan supporters will make any excuse, use any justification to ensure that people do not forget that the goal of removing PM Najib Razak trumps everything else. If Najib had said it, opposition supporters would be telling Indians how the Umno grand poobah disrespects them and they should vote for the opposition. I wonder how many racists, bigots, religious extremists, chauvinists and other kleptocrats it takes to dethrone the current Umno grand poobah? And if the word is not a racial slur, I wonder if the Indians in DAP and PKR allow themselves or have no issue when their Chinese and Malay comrades refers to them as “keling”? As someone who has been on the receiving end of such racism on these forums and in other places, I wonder if the next time I meet a political operative from Harapan they will refer to me as “keling”. Mahathir, if he was referring to attacks against his ancestry, could have just said, “Let me use a Tamil word” but instead he chose to use a derogatory term and compliant hypocritical supporters, who slavishly follow the party line bend over backwards attempting to justify its usage. I guess we are getting a hint of the shape of things to come when it involves the politics of race under a Harapan government. Then, of course, there is the issue of the young prince from Johor talking about the forked tongue one. I have had many emails asking me what I thought about the old maverick's comment. My answer is this. Good for him. When the young prince was making statements about corruption, and race relations which opposition supporters agreed with, they were practically prostrating themselves in the comments section of the alternative media praising him as though he was the second coming. They were reaffirming their belief in the monarchy system and pleading with him to lead the country. When his father made statements that were in alignment with their beliefs, opposition supporters were so enamoured with his statements that some of them even suggested moving to Johor. All of this naked adulation was embarrassing because it showed that whenever anyone says anything which remotely conforms to opposition expectations, the Harapan faithful would fall on their knees, especially if it came from a Malay. Now people are saying that the royalty should not get involved in politics. What utter horse manure. For the majority of opposition supporters, the royalty should not get involved in politics as long as the royalty supports the Umno establishment. If the royalty says anything that remotely sounds as if they support the opposition or mention things that the opposition says, then this golden rule of the separation between palace and state is ignored by most opposition supporters. What did the prince actually say? He said that people should endorse the status quo. He said that the status quo needed to be reformed. He reminded people of the misdeeds of the Harapan’s ‘chosen one’. He also hinted that the royal house of Johor would attempt to reform the government from the inside and this involved high royal manoeuvres. All of which neatly falls into traditional Malay politics. Fair enough. If you are a BN supporter and you were struggling to define the election beyond the 1MDB issue, the words of the young prince and the election manifesto of BN would be a starting point to change the narrative. Of course, since open criticism of what the young prince said is verboten, and let’s face facts, opposition supporters have such a quaint way of expressing their displeasure against anyone who thinks they are against Harapan, this would mean that opposition supporters cannot openly attack the young prince. But really, there is nothing that the young prince said that the majority of opposition supporters have not sublimated, rationalised or justified in their support to overthrow Najib. I would argue that this statement by the crown prince is exactly what the Umno establishment needed. It was exactly what establishment supporters needed because it came from a person who until he made these statements was beloved by a majority of opposition supporters. I, of course, have a different view of things. I, too, think the Umno hegemon needs to be benched. I know the system needs reform. But I want people to point out the flaws in the opposition like the way how the young prince pointed out the flaws in the establishment. I want the opposition, even now, to realise that they are on notice. The system is against you? Well, tough cookies. You knew what you were up against when you, me and anyone in the opposition decided that a two-party system is needed to save Malaysia. If you are an opposition supporter and feels as if you are fighting with one hand tied behind your back, that’s too bad. Remember that the next time you mob against people who have different ideas from the group think that infects opposition spaces. I do not want rabid mobs thinking any criticism of the opposition means the people making those criticisms are ‘dedak’ eaters or working with the establishment. And since the Najib regime has taken a page from the Donald Trump playbook, I will take a page from Hillary Clinton's. Remember Hillary’s slogan, "I’m with her"? For the moment, because I want a two-party system, I’m with the forked tongue one. Wednesday: Is this really our final battle?